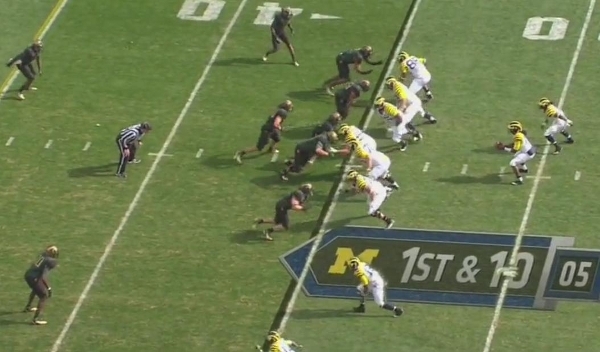 We've already seen that Michigan struggled to run the ball against Michigan State. Much of that is due to the Spartans blitzing consistently and completely selling out on the run. Despite some pre-snap alignments that would've been gold to Rodriguez's staff last year, Michigan ran directly into the strength of the MSU defense en route to their far and away worst rushing performance of the season. The one blitz that MSU used most frequently--or maybe just to the greatest effect--was a linebacker blitz in which the strongside and middle linebackers blitzed the A gap. The following is just one of many examples of how the blitz worked. 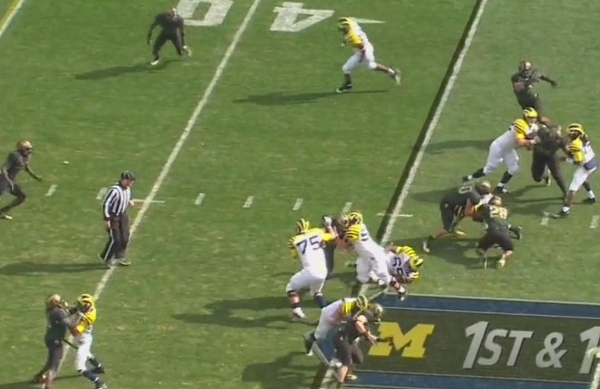 Michigan comes out in a three-wide set with Vincent Smith in the backfield. If you're screaming at the computer screen "LOOK AT THE OPEN BUBBLE SCREEN", please stop. They can't hear you. Also, the game is over. Michigan State is in a 4-3 even formation with the WLB set up as the EMLOS. As the ball is snapped, Michigan State rushes all four down linemen as well as the WLB and MLB, who are blitzing the A gap. The SLB drops off as an extra contain man should Denard pull the ball on the zone read. A moment later, Denard is reading the strongside defensive end (William Gholston) who Koger left unblocked. Koger is releasing to the second level to block the SLB. Since Gholston is keeping contain, the proper read is to hand the ball of to Smith. Unfortunately, MSU has overloaded the A gap with blitzers that are staring down Smith in the backfield. FWIW, Omameh misses his block here, but even if he hadn't, MSU's weakside linebacker was also blitzing into the gap. This is the same premise as Mattison's stunt blitzes against Western Michigan in which the defense overloaded one side of the offensive line and blitzed a specific gap. 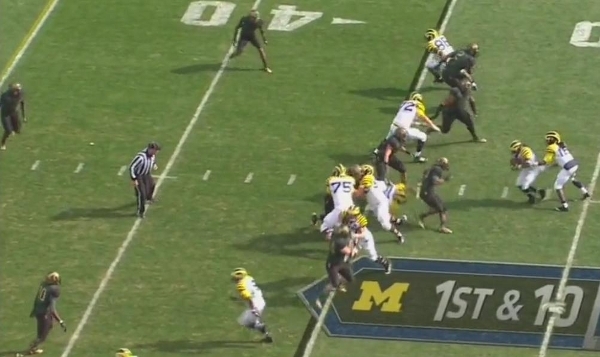 As Denard completes the handoff, Smith is bottled up. He's brought down behind the line of scrimmage. If Denard had kept the ball, he would've had two defenders in his face: the first is Gholston; the other is the MSU defensive tackle who's participating in Mark Huyge's SitB charity. With the windy conditions and Denard's inability to throw the ball down the field, MSU spent most of the day selling out on the run like this. (They also used this same blitz on passing downs, including the pick-six that effectively ended the game.) This blitz effectively shuts down Michigan's zone read: by tasking the weakside defensive end with keeping contain on Denard, MSU can force him to hand the ball of into the teeth of the blitz. The way to combat it is to make an adjustment at the line of scrimmage. 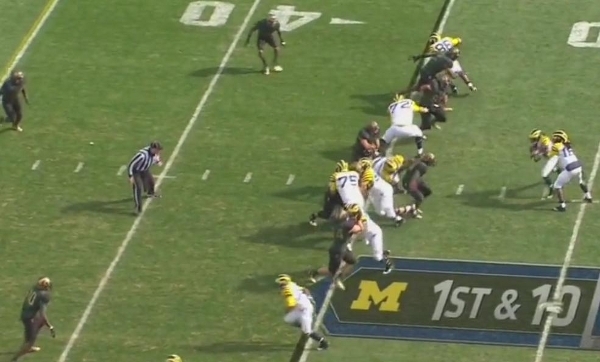 Last year, Michigan would've checked out of this run and thrown a bubble screen. 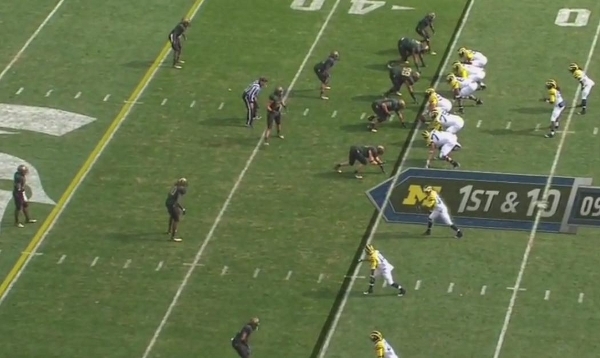 It was wide open and Michigan had a clear numbers advantage. Instead, Borges insists on running what's called in the huddle, which produces results like this. The fear is that other teams will replicate it. While it's unlikely that any other group of corners and safeties in the Big Ten will be able to cover Michigan's receivers this well for an entire game--nor is there likely to be these adverse conditions again--this at least provides a blueprint for how to shut down Michigan's zone read game. Borges will need to come up with variations on the running game or check into more advantageous plays when defenses present an unsound defensive front. so frustrating...unbelievable how bad of a day Borges had with the play-calling. Totally mismanaged the game. Its like we didn't change our plan based on the gale force wins and MSU blitz on everything game scheme at all. And this was the same gameplan they used against OSU so its not like we didn't know about it. Borges has 2 weeks to come up with ways to counter the stack the box approach. I hope he's learned that just chuck it doesn't work. OSU and ILL to a lesser extent can execute MSUs strategy pretty easily.